North Korean leader Kim Jong Un bids farewell to the crowd before boarding his train to depart for North Korea at Dong Dang railway station in Vietnam, March 2, 2019. 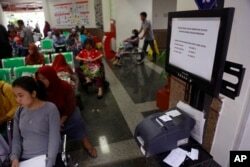 FILE - Patients wait near a queue number dispenser affected by WannaCry attack at Dharmais Cancer Hospital in Jakarta, Indonesia, May 15, 2017. 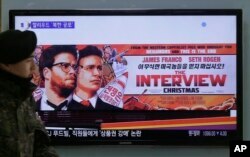 FILE - A South Korean army soldier walks near a TV screen showing an advertisement of Sony Picture's "The Interview," at the Seoul Railway Station in Seoul, South Korea, Dec. 22, 2014.